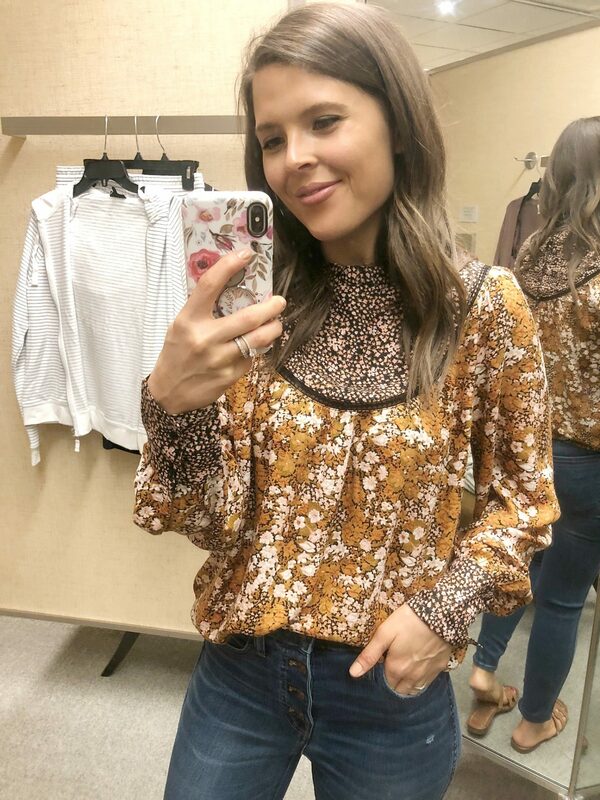 Nordstrom Anniversary Sale 2018: Try-on haul with my favorite items! TGIF! I hope everyone’s weekend is off to a great start. Have you had a chance to shop the Nordstrom Anniversary Sale yet? I can’t believe how fast things are selling out! You’ll definitely want to act fast to take advantage of the amazing prices. 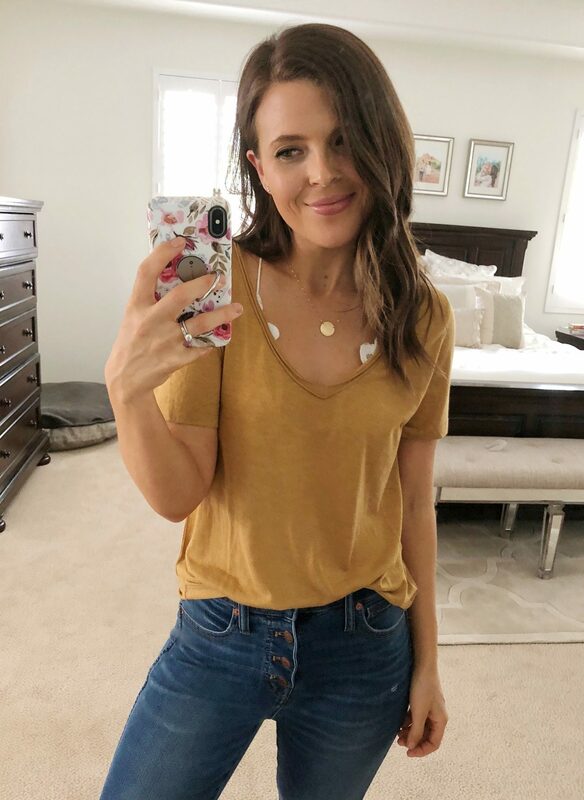 I’ve included all of the items I found shopping the first day of the Nordstrom Anniversary Sale below. I’ve also included sizing tips and pricing information for everything. 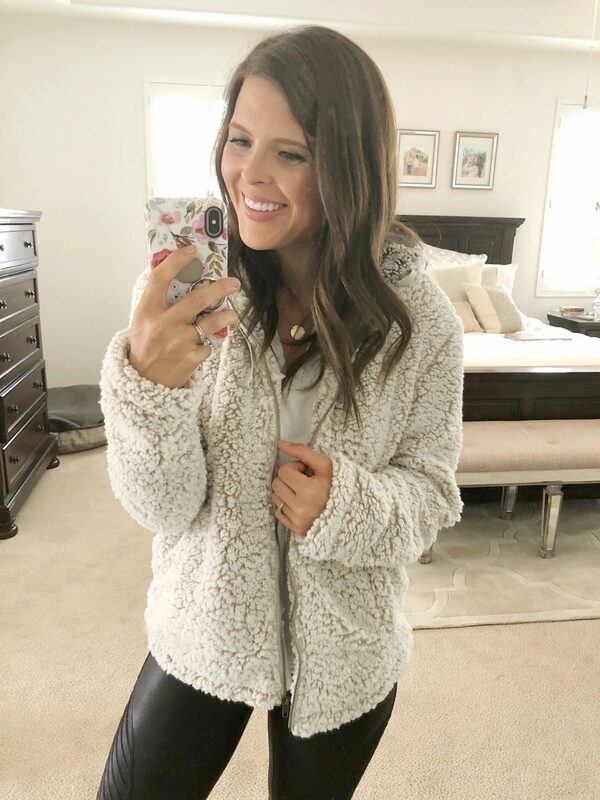 Some of the items I’ve included in my first day finds from the Nordstrom Anniversary Sale are already out of stock or running low on sizes but I still wanted to make sure to include them in case Nordstrom does restocks throughout the sale. If you find something you love that’s out of stock, you can reference back to this post to check and see if they’ve restocked or if returns start coming in and I’ll do my best to notify you over on Instagram when restocks/returns happen. I’d love to hear what your favorite item from the sale is this year! 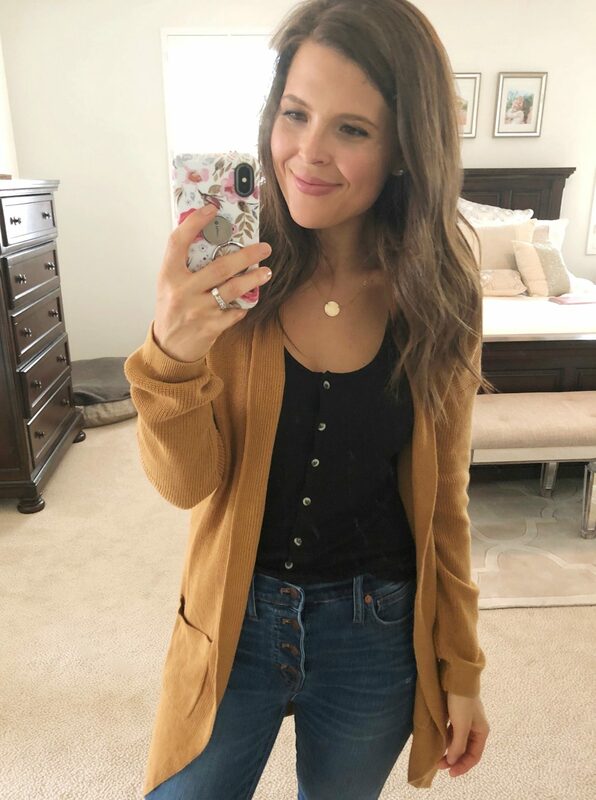 Please let me know if there are any specific Nordstrom Anniversary Sale posts that you’d like me to cover and I’ll do my best to make it happen! 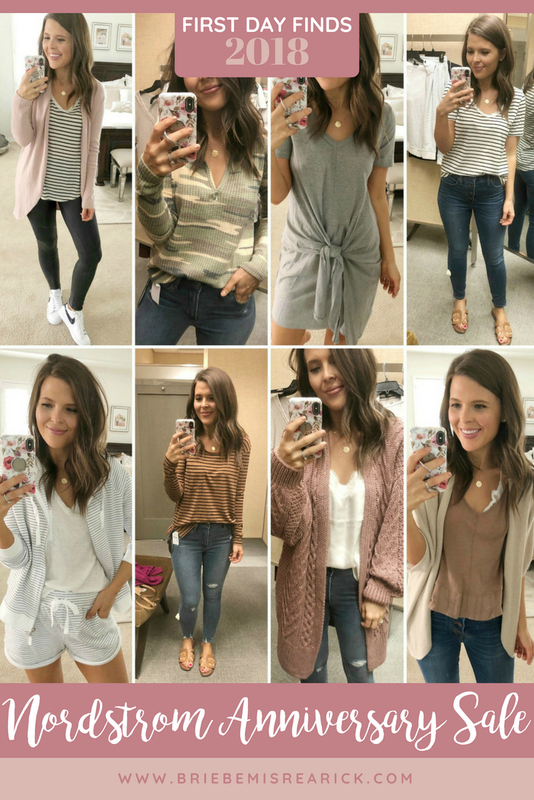 In the mean time, you can also check out my other Nordstrom Anniversary Sale posts here and here. BP.Raw Edge Scoop Neck Tee: Sale Price: $18.90 // After Sale Price: $29.00 // Sizing: Runs true to size, wearing a size small. Articles of Society Heather High Waist Distressed Skinny Jeans: Sale Price: $44.90 // After Sale Price: $68.00 // Sizing: True to size, wearing a size 26. BP. Raw Edge V-Neck Tee: Sale Price: $11.90 // After Sale Price: $17.00 // Sizing: True to size, wearing size small. Madewell 10-Inch High Waist Skinny Jeans: Sale Price: $89.90 // After Sale Price: $135.00 // Sizing: If in between sizes, size down. I’m usually between a 26/27 and am wearing a 27 because they were sold out of the 26. If they restock, I definitely plan to exchange for a 26 because these ones are a little loose, especially around the knees. Leith Ribbed Shawl Cocoon Cardigan: Sale Price: $45.90 // After Sale Price: $69.00 // Sizing: Runs large, sized down to an XS. This is actually last year’s version without the ribbing. I like the ribbed version better because it looks a little more fitted in the arms. SPANX Faux Leather Moto Leggings: Sale Price: $72.90 // After Sale Price: $110.00 // Sizing: True to size, wearing a size small. Nike Blazer Low Essential Sneaker: Sale Price: $55.90 // After Sale Price: $75.00 // Sizing: Runs large, order 1/2 size down. BP. Twist Front Sweater: Sale Price: $31.90 // After Sale Price: $49.00 // Sizing: Runs true to size, wearing size small. 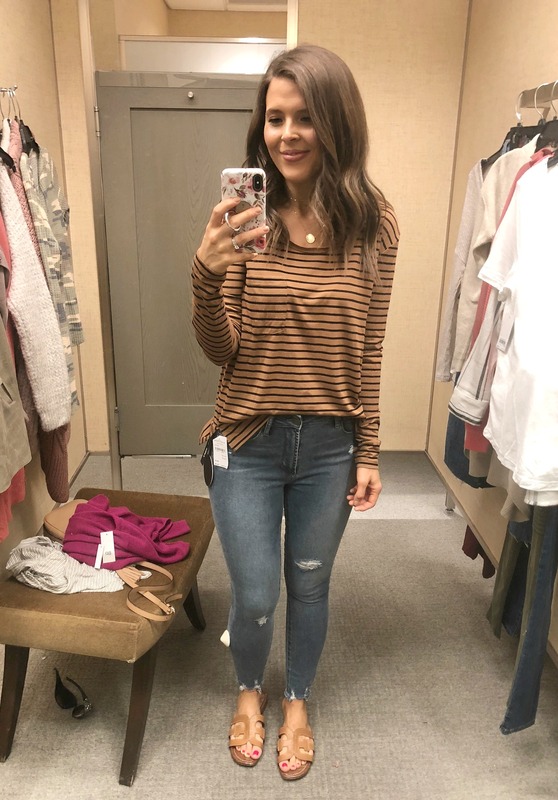 Topshop Stripe Hoodie: Sale Price: $32.90 // After Sale Price: $50.00 // Sizing: Sized up to a medium for a looser more comfy fit. Topshop Stripe Pajama Shorts: Sale Price: $19.90 // After Sale Price: $30.00 // Sizing: Sized up to a medium for a looser more comfy fit. 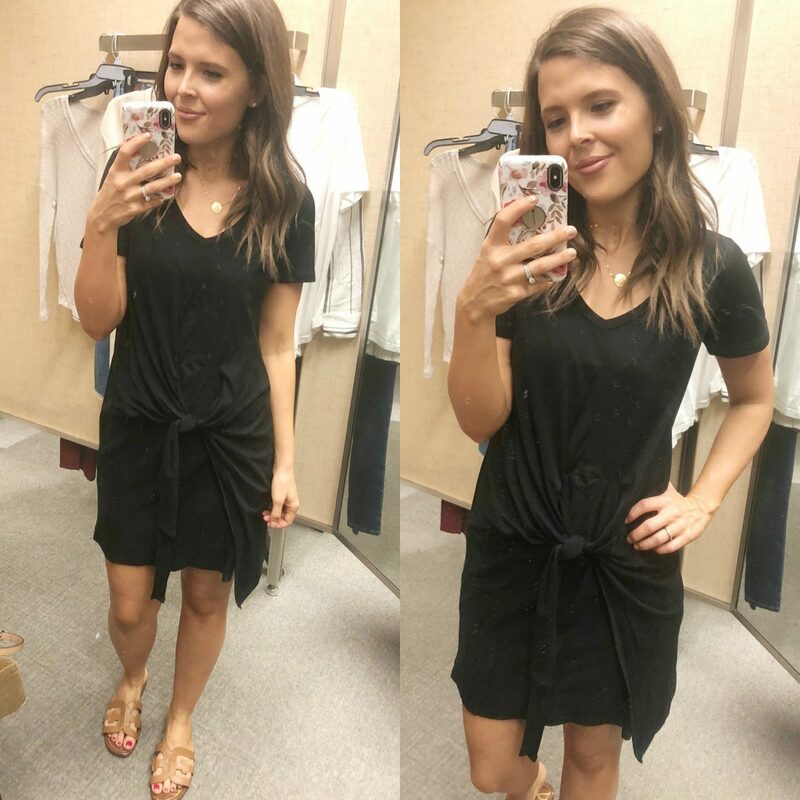 Socialite Tie Waist T-Shirt Dress: Sale Price: $31.90 // After Sale Price: $49.00 // Sizing: True to size, wearing a size small. Socialite Thermal Henley Top: Sale Price: $24.90 // After Sale Price: $38.00 // Sizing: Runs small, wearing a size medium. 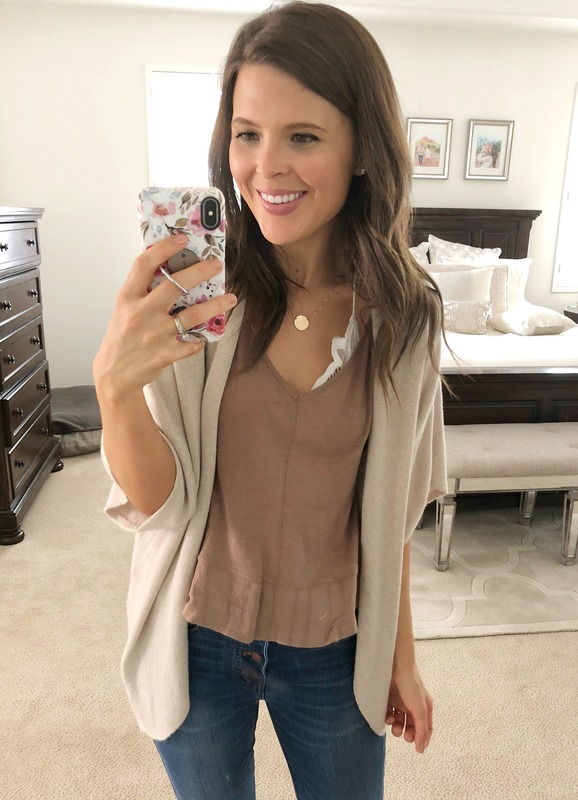 Topshop Long Open Front Cardi: Sale Price: $49.90 // After Sale Price: $75.00 // Sizing: Runs large, order one size down. Wearing a size 4 which says it fits like a 0-2 but it is still oversized. BP. Lace Trim Satin Camisole: Sale Price: $22.90 // After Sale Price: $35.00 // Sizing: True to size, wearing a size small. BP. Exposed Seam Sweater: Sale Price: $31.90 // After Sale Price: $49.00 // Sizing: Runs true to size, wearing a size small. BP. 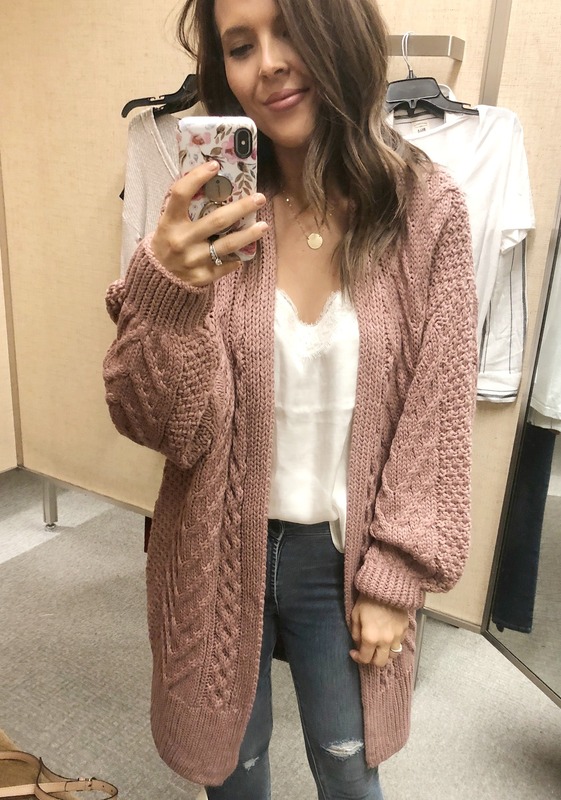 Oversized Waffle Stitch Cardigan: Sale Price: $45.90 // After Sale Price: $69.00 // Sizing: Runs large, wearing a size XS. BP. 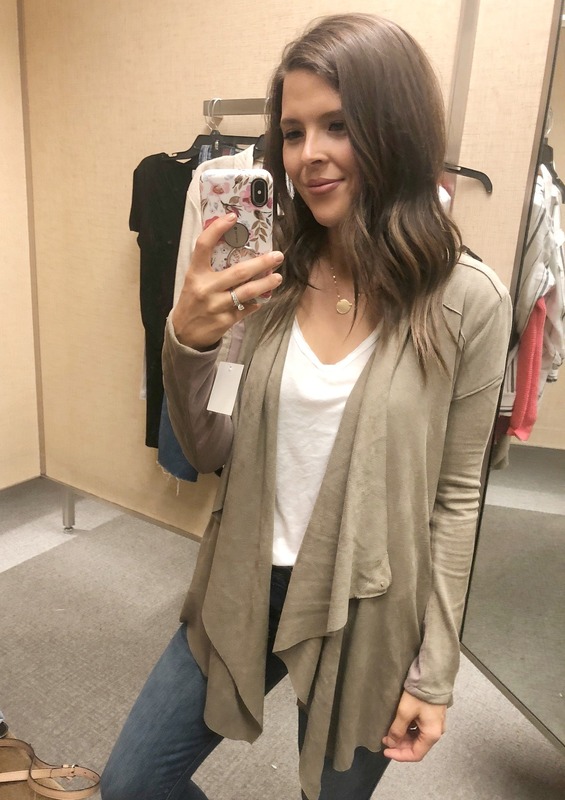 Stitch Curve Hem Cardigan: Sale Price: $31.90 // After Sale Price: $49.00 // Sizing: Runs true to size, wearing a size small. Socialite Button Front Top: Sale Price: $24.90 // After Sale Price: $38.00 // Sizing: Runs true to size, wearing a size small. BLANKNYC Cloud Nine Drape Jacket: Sale Price: $59.90 // After Sale Price: $90.00 // Sizing: True to size, wearing a size small. BP. Ribbed Cardigan: Sale Price: $25.90 // After Sale Price: $39.00 // Sizing: True to size, wearing a size small. BP. Washed Moto Leggings: Sale Price: $25.90 // After Sale Price: $39.00 // Mine look a little different because they are last year’s version. Hinge Mix Print Top: Sale Price: $52.90 // After Sale Price: $79.00 // Sizing: Fits true to size, wearing a size small. Leith Dolman Sleeve Cardigan: Sale Price: $42.90 // After Sale Price: $65.00 // Sizing: Runs large, wearing a size XS. Ten Sixty Sherman Flare Hem Tank Top: Sale Price: $15.90 // After Sale Price: $24.00 // Sizing: True to size, wearing a size small. Thread & Supply Brandon Fleece Jacket: Sale Price: $58.90 // After Sale Price: $88.00 // Sizing: Runs slightly large but still wearing my normal size small. Love that short set you got. Thanks! It’s definitely my favorite loungewear from this year’s sale!